Above: two small individuals of the meteorite shower of February 2013, classified as LL5 (S4, W0). Each sample shows a beautiful black fusion crust, partially broken to reveal a pale interior, characteristic of typical ordinary chondrite meteorites. The larger piece reveals a thin black veinlet of impact melt (see below), cutting the pale bulk of the meteorite. The veinlet, visible here on the right-hand side of the upper surface, clearly lies beneath the glossy black fusion crust, which formed during the fragmentation of the parent body that occurred during atmospheric entry. Samples from Blaine Reed. The larger piece is 45x26x21 mm in size, 37.05 grams, magnetic susceptibility (uncorrected) averages 20.8x10-3 SI units. The smaller piece is 31x17x9 mm, weight 6.70 grams. The pale interior, paucity of metal grains, and correspondingly modest magnetic susceptibility are all consistent with an LL chondrite. Occupants of the city of Chelyabinsk had a rude surprise at 09:22 hours local time on 15 February 2013. A brilliant fireball, captured on video across the city -- and especially on local highways -- captivated television audiences worldwide. Not everyone would have seen the fireball, but few could have missed the effects of the associated atmospheric blast wave, which shattered thousands of windows and caused many injuries due to flying glass. Canadian scientists at Western University (at the city of London in southwest Ontario) were amongst the first to offer remarkably robust estimates of the magnitude of the event (see reporting by Allen, 2013; Semeniuk, 2013). According to the Meteoritical Bulletin (MB 102, accessed 02 June 2013) the widely-felt shock wave was followed by a meteorite shower which deposited thousands of mostly small, fusion-crusted individual meteorite fragments across the snowy landscape, some 40 km south of the city. The snow cover was about 70 cm (27.5 inches) deep and only the largest penetrated to the frozen soil. Individual sizes range from <1 g to 1800 g, and from a few mm to 10 cm, mainly no more than 3-6 cm in size. The total known weight (TKW) is uncertain, certainly >100 kg and maybe even >500 kg. In terms of both the numbers of individual fragments, and the fall on a frozen winter landscape, the Chelyabinsk fall has parallels with the 20 November 2008 fall of the Buzzard Coulee (H4) meteorite shower in Saskatchewan, Canada. The TKW for Buzzard Coulee is somewhere upwards of 200 kg distributed in over 1,000 mostly small individuals (these numbers are necessarily conservative). Small individual samples and sawn slices of "Chelyabinsk" were available from U.S. meteorite dealers by late April. The meteorite was characterized and classified by staff of the Vernadsky Institute of Geochemistry and Analytical Chemistry. According to D.D. Badyukov and M.A. Nazarov of the Vernadsky Institute, there are two main lithologies. 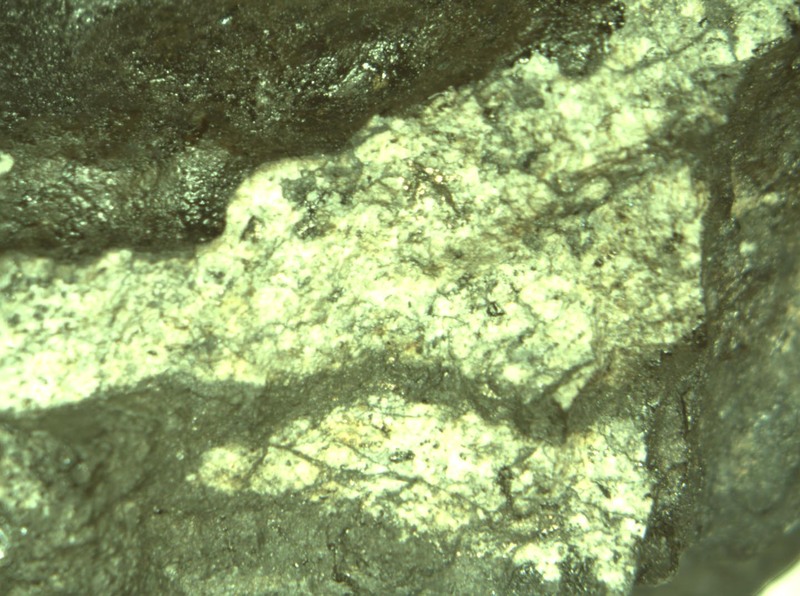 Two-thirds of the stones are a pale, iron-poor (LL) ordinary chondrite, with some 63% chondrules (individual chondrules averaging 0.93 mm in diameter). The silicate compositions are equilibrated, and include olivine (Fa27.9) and orthopyroxene (Of22.8), with 4 vol.% troilite and 1.3 vol.% Ni-Fe metal. One-third of the stones exhibit a dark impact melt with mineral and chondrule fragments, and shocked feldspar which is practically isotropic. See the Meteoritical Bulletin for further details. Above: two views of the larger piece, at a nominal stereomicroscope magnification of 6X, long-axis field of view 20 mm. 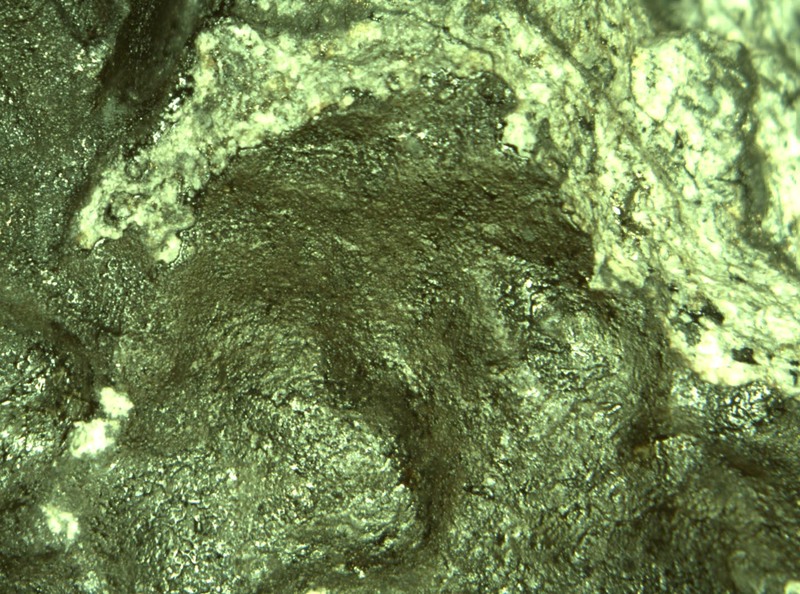 At left is a close-up of the fusion crust. The pale granular interior is flecked with grains of steel-grey metal and tawny troilite. At right is a close-up of the zig-zag trace of a thin brittle fracture, infilled by black impact melt. The Park Forest L5 (S5, W0) chondrite fell in Illinois, U.S.A. on 26 March 2003. It is appreciably more metal-rich, as one would expect, but the pale interior cut by thin black melt veins has more than a passing similarity to veined Chelyabinsk samples. Allen,K (2013) Canadians size up Russian fireball. Toronto Star, A4, 12 April. Semeniuk,I (2013) "It's a wake-up call", scientists warn. Globe and Mail, A14, 16 February. Visit the Meteoritical Bulletin and type "Chelyabinsk" (or any other meteorite name) in the search field. As indicated below, some two dozen detailed, 1-page abstracts on many aspects of the Chelyabinsk fireball event and meteorite shower should be available on-line sometime in the second half of 2013. 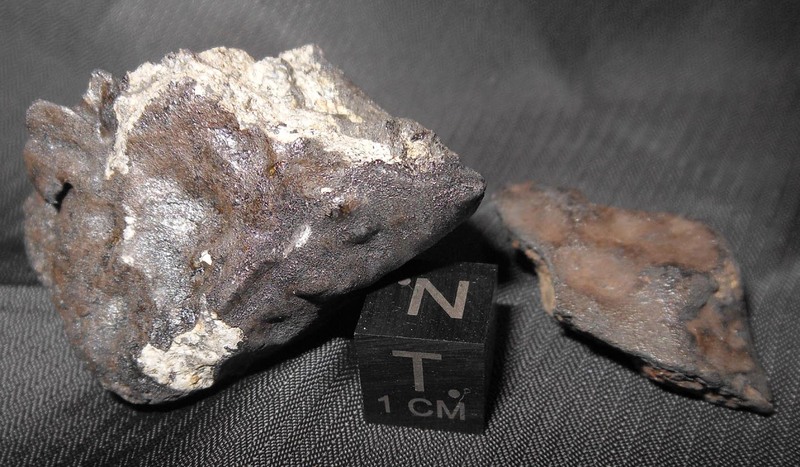 The 76th Annual Meeting of the Meteoritical Society, in Edmonton, will feature both oral presentations and posters on this spectacular meteorite fall. Graham Wilson, 02-05 June 2013, minor edit 22 December 2014. --- with more information on the sequence of events. --- at least 22 talks and posters were scheduled on the remarkable Chelyabinsk event.